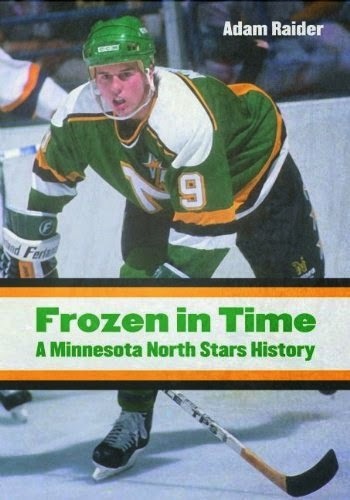 Frozen in Time: A Minnesota North Stars History by Adam Raider, University of Nebraska Press. From The Publisher: In 1967 the National Hockey League decided to double its size from six teams to twelve. This expansion was the first of its kind, and Minnesota, with its rich hockey history, was a natural choice for a new franchise. Thus the Minnesota North Stars were born. Frozen in Time examines the organization's signature seasons, from the late 1970s, when the club was at its worst, to its two surprising runs to the Stanley Cup Finals. The book recalls the exploits of characters such as Wren Blair, the firebrand ex-scout who would become the team's first coach and general manager, and owner Norm Green, the man who moved the team to Texas in 1993, making him one of the most hated men in Minnesota. Here, too, is the tragic story of Bill Masterton, an original North Star whose death in 1968 as the result of an on-ice injury remains the only one in the history of the league. The team's engaging history is brought to life with vivid recollections from former players and legends, including Cesare Maniago, Tom Reid, and Bobby Smith, and from journalists, broadcasters, front office executives, and faithful fans. Also including season-by-season summaries, player profiles, and statistics, Frozen in Time offers an authoritative and nostalgic look at Minnesota's still-beloved North Stars and a bygone era of pro hockey.